PDF files are well-known format as they are standard document user for presenting documents which is independent of any application software, hardware and operating systems. The portability of PDF files makes this format popular among all the classes of users – home user, business users, technical users etc. Saving documents as PDF is the most effective way to keep your documents, specifically emails, as they safe from being changed, mis-typing or saving to avoid unwanted use of it. With this zimlet, you can now save your emails from Zimbra desktop to PDF file format. This tool creates separated PDF files for each emails with keeping all the meta details in the headers of the PDF. Formatting, hyperlinks and other graphic of the emails can be well preserved in the resultant PDF files. Oh I simply loved it! Never though changing emails into document form will be so easy. 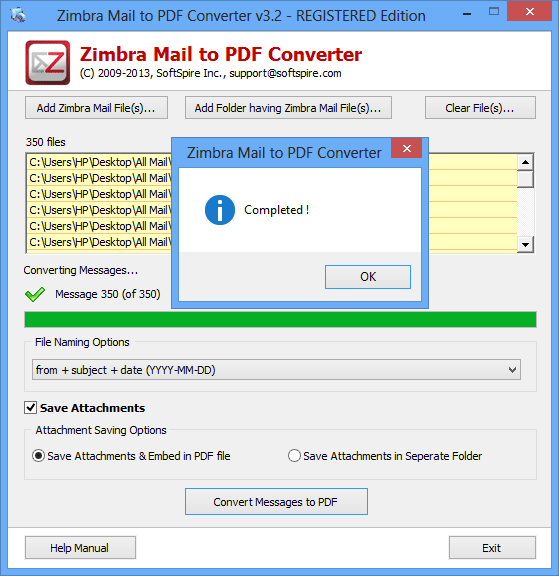 It was so easy to change Zimbra emails to PDF document with this solution.